In Making Shapes More Efficient: Using Fewer Shapes & Groups, we hinted that there was work to be done when resizing the Cisco shapes. 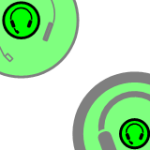 Nothing Earth-shaking, but if you look close, you’ll notice two things: the LineWeight for the shapes doesn’t get any thicker, and the headphones pull a weird squishy maneuver. It would be nice if we could get the LineWeight of the shape to change when the size of the shape changes. We can do this by using the ShapeSheet to link a sub-shape’s LineWeight to the size of the group. Now, there is no “size” property for a shape, but there are Width and Height. And since these shapes should maintain aspect ratio, it doesn’t really matter if we choose the Height or the Width as the key for indicating size change–in most cases they should both be increasing by the same factor. Using the ShapeSheet, we can construct a smart formula that compares the original height of the shape to the current height of the shape. This ratio then serves as a multiplier for the LineWeight of each sub-shape. If you’ve read: Text Resizing with ShapeSheet Formulas then you might recognize this technique! Of course, I didn’t open the ShapeSheet for every single sub-shape on the page. I wrote some VBA automation code to get it done more quickly. Below, we have the code, which can also be used, with very little modification, in VB.NET. The code operates on all shapes that are selected in the active window. So make a few duplicates, select them, and run the code on the guinea-pig shapes first! '// size of the group. To see the ShapeSheet of a sub-shape, you need to sub-select the shape, then choose Window > Show ShapeSheet. To sub-select a shape, you first select the group, wait a split second, then click again on one of the sub-shapes. The sub-shape will be highlighted with light-green handles. Alternatively, you can open the group window via Edit > Open Group or Edit > Open ShapeName. Inside the group window, you can select shapes as you normally do, and view their ShapeSheets via Window > Show ShapeSheet. To get the ID for the group, just select the group and choose Format > Special. At the top of the dialog, you’ll see the ID field. When you want to refer to cells in the group from sub-shapes, you use the syntax: Sheet.ID!Property. Examples would look like this: Sheet.5!Width, Sheet.168!Angle, Sheet.99!Prop.Cost, and so on. Visio 2007 users might not see the Format menu. If this is the case, you need to turn on Developer Mode by visiting the Tools > Options > Advanced tab. While we were focusing on the resize behavior of the Cisco shapes, we also fixed the problem with the squishy headphone arc. The source of the problem is that the arc from which the headphones were drawn was still a 1D shape. 1D shapes are defined by their endpoints, as opposed to a Width, Height, and Pin location, like normal 2D shapes (ie: boxes.) When 1D shapes are grouped, their endpoints resize proportional to the group, but the height of the sub-shape isn’t affected. – I think the equation is wrong…..should be LW_new = LW_old *(GH_new/GH_old). These shapes are likely to have their aspect-ratios maintained, so keying the LineWeight off of the height is just fine. But for shapes that could be resized in either dimension, you are right, the width needs to be taken into account. Not sure what you mean by “far easier in the ShapeSheet”. This technique is 100% ShapeSheet, but without the numerical reduction that you’ve suggested. The VBA code simply sets the smarts automatically in all the sub-shapes, so that you don’t have to do it by hand! And you’re right, a top-level “scale-factor” could be implemented, with a reduction of the fixed numbers. But for instructional purposes, I’ve left some of the simplifications out. I also didn’t want to add user-cells to the shapes, because that unnecessarily complicates the code for this simple example. It looks like you intended to include character scaling as well (assuming the fs variable is font size). Can you provide the code to do that? Wondering about the VB sub code… In a lot of cases I have shapes that are nested more then two deep in most cases in complex shapes I have at least 4 levels of shapes. Your Sub routine only accounts for one or does it? I’ve written similar code that uses recursion. My question is would recursion be needed here if my shapes are more than one level deep, or does Visio handle this differently than I expect? Yeah, you’d have to write some recursive code. It’s not too hard as every Visio shape has a shapes collection, so you can get at sub-shapes via shp.Shapes. There’s a bit of an inconsistency between code and the UI. If, for example you select a group in a drawing window and apply a fill color, that color will apply all the way down to the deepest sub-shape. I’m trying to use both the line and text resizing formulas on a fairly simple shape group and can’t get either formula to work. The concept seems fairly straightforward; I can’t imagine what I might be doing wrong. Should this work in all versions of Visio? (I have ’03 on my work machine.) Thanks for the help! Ha! Figured out what I was doing wrong (applying the formula to the group, not the sub-shape). Thanks for the awesome tips!